Deshaies, on the Caribbean coast of Guadeloupe, is known for its beautiful sunsets. 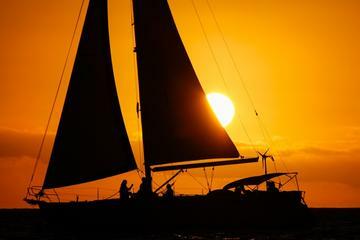 There is nothing more tranquil or romantic than sailing across this scenic coast as the crimson sun dips into the deep blue waters of the Caribbean sea. Imagine relaxing on the deck of a beautiful 44-foot Bavaria boat with a delicious glass of punch in your hand as the wind pushes you across the crystal clear waters of Deshaies Bay at sunset.